The Texas Bay Area Genealogical Society had our annual Show & Tell meeting on Friday night. One of the speakers revealed an amazing story of genealogical serendipity. Several members of the society brought artifacts to display and they each told a story about the items. Two sisters, Denise and Cheryl Willis brought a picture and an album that they inherited from their grandmother's estate. Center and right are Denise and Cheryl Willis. On the left is their cousin, Joy Lloyd. They are displaying a photo album and a picture that were passed down to them without knowing the names of the people in the pictures. Denise told the story of how they had received a framed picture and a photo album from their grandmother's home. The names of the people in the pictures were a mystery until they attended the German Special Interest Group sessions this spring at the Friendswood Library. I presented a series of three sessions on how to trace your German speaking ancestors. At one of the sessions, our past president, Bill Mayo, brought some of his publications from the German Texas Heritage Society. Denise was browsing the journals and found an article with a picture of her mystery ancestor. 2012 Article from Texas German Heritage Society with a picture of their ancestor. The article identified the woman as Karoline Westerfeld, wife of Fritz Lehde. There were several more pictures in the article that also identified other family members from the photo album. Karoline was born 29 November 1844 in Oppenwehe, Westphalia. She married Fritz Lehde at Eben Ezer Lutheran Church in Berlin, Washington County, Texas. The Willis sisters were ecstatic to make this discovery about their 2nd great grandmother. 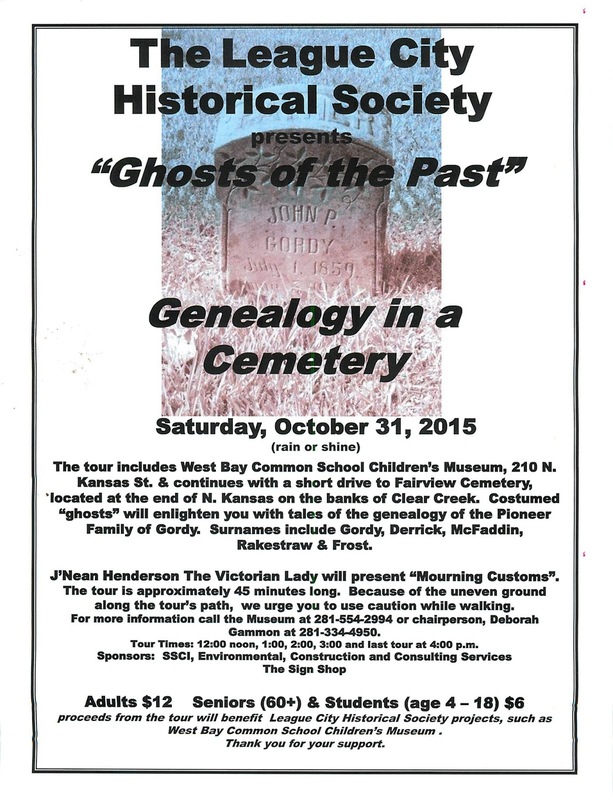 Perhaps you can make an equally exciting discovery at one of our Bay Area Genealogical Society events! We have a German presentation planned for Saturday, September 19, 2015 from 2-4 p.m. at the Harris County, Freeman Branch Library, 16616 Diana Ln, Houston, TX 77062. Gay Carter will be presenting a German case study. Beth Marshall brought several of her family artifacts for the BAGS Show & Tell session. Tentatively set for February is a presentation by Beth Marshall on understanding the science behind genealogy DNA testing. Beth also brought some artifacts from her family. Beth is a retired science teacher. Her presentation will simplify the science of DNA and its application to genealogy. I am hoping that Beth can help me sort through my DNA results which are expected in 3-6 weeks. My client Dr. Gesenia Sloan Pena has received her results and we are in the process of reviewing her list of matches too. Another upcoming event that I highly recommend is coming up on Halloween. 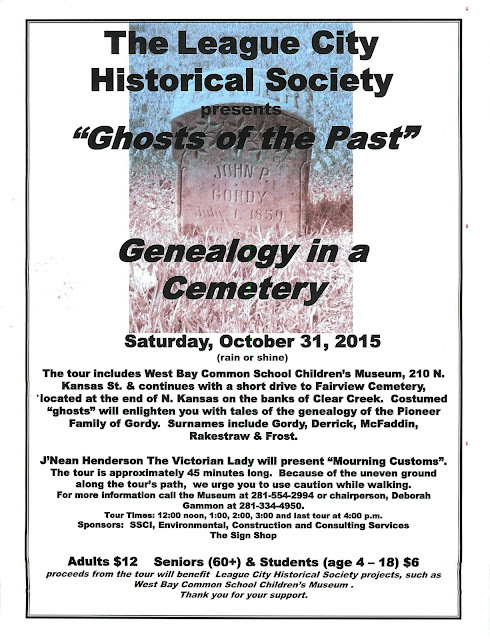 The League City Historical Society is presenting "Ghosts of the Past." The Historical Society is offering a series of 45 minute tours of the Fairview Cemetery with tales of the genealogy of pioneer families of League City. The tours begin at 12:00 noon, 1:00 pm, 2:00 pm, 3:00 pm and the last tour is at 4:00 pm. DNA Testing- Will We Have Unexpected Results?